Early on January 1, while New Year celebrations were still underway in the United States, the Catalina Sky Survey near Tucson, Arizona, spotted what was possibly a very small asteroid — 2 to 3 meters in size — on a potential impact trajectory with Earth. Designated 2014 AA, which would make it the first asteroid discovery of 2014, the track of observations on the object allowed only an uncertain orbit to be calculated, NASA said in a press release. If this was a very small asteroid on an Earth-impacting trajectory, it most likely entered Earth’s atmosphere sometime between 2 p.m. EST (19:00 UTC) January 1 and 9 a.m. EST (14:00 UTC) January 2. Using the only available observations, three independent projections of the possible orbit are in agreement that 2014 AA would hit Earth’s atmosphere. The potential impact locations are widely distributed because of the orbit uncertainty, falling along an arc extending from Central America to East Africa. The most likely impact location was just off the coast of West Africa at about 9 p.m. EST January 1 (02:00 January 2 UTC). It is unlikely asteroid 2014 AA would have survived atmospheric entry intact, as it was comparable in size to asteroid 2008 TC3, which was about 2 to 3 meters in size and completely broke up over northern Sudan in October 2008. 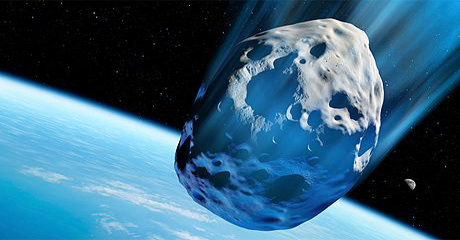 (Asteroid 2008 TC3 is the only other example of an object discovered just before it hit Earth.) So far, there have been a few weak signals collected from infrasound stations in that region of the world that are being analyzed to see if they could be correlated to the atmospheric entry of 2014 AA.